Questions and answers of "Kubla Khan". 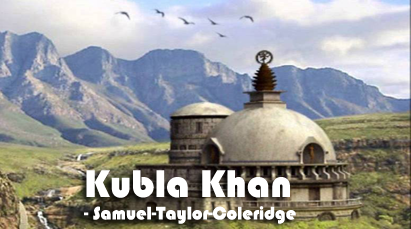 "Kubla Khan" was written by Samuel Taylor Coleridge. S.T. Coleridge was a great romantic poet. He was an opium eater and he had eaten opium just before writing this poem. He was sleeping and in the dream he saw this dream. He got up and started writing this poem about Kubla Khan. In the middle, a business man came and disturbed. So this poem was left incomplete. This poem describes an ideal luxurios house in Xanadu. The place is very beautiful where Alph river goes underground. The trees are flowering and giving scent. It is very mysterious and miraculous place. It is a part of heaven. It is imaginative place. Answer: Of the pleasure-dome in Xanadu decreed ( आदेश दिईएको ) by Kubla Khan. Answer: It covers the land of ten miles. Answer: There grow 'innocence-bearing' trees. Answer: 'Huge fragments' and 'the sacred rivers' emerge from the fountain. Answer: The lines 26 and 27 echo lines 3 to 5. Answer: Kubla Khan hears sound of "Ancestral voices prophesying war". Answer: The importance of the word 'decree' is order and power of Kubla Khan. 'So' proves that his ordered was obeyed. The pleasure dome was built. Question No. 2: The third part of the poem seems at first to have nothing to do with the earlier parts. Answer: The poet is speaking. Answer: He remembers the vision of an Abyssinian maid. Answer: He wants to recall the sound of that vision because he would then in deep delight, be able to recreate the pleasure-dome. Answer: The result would be that everyone could see that sunny dome, those caves of ice and would consider the poet a man enchanted, a man who had seen a vision of heaven and brought it back to the earth. Answer: He would have great power, if he were able to create such a great pleasure-dome. Answer: The 'damsel with dulcimer' represent some kind of perfect harmony of sight and sound to the poet. Answer: Coleridge has presented the visual symbols which the readers can visualize when they read the poem. In this poem, the ideas of perfection and other places are important which can be drawn in the map. The map also brings out some of the opposite in the poem like 'fountain', 'sunless sea', 'caverns', 'artificial caves', 'sunny spots of greenery', 'savage place', etc. Another kind of completed map will look something like this. Answer: The pleasure dome of the poem is a kind of perfection of the both holy and enchanted which means savage place and the 'deep romantic chasm' as is the vision of 'damsel with a dulcimer'. The poet too would become 'holy and enchanted' himself the 'symphony and song' of the vision. Answer: Lines 42 to 49 are conditional based on the hypothetical revival of the 'symphony and song'. The 'cry' is in the present tense because the poet who had such a vision would now be worthy of such reverence because of the fact of having fed 'on honey-dew' and drunk the milk of paradise. If the poet had built that dome in air, it could only have been through heavenly vision. Answer: Directly, there are not any negative words but there are limitations of the vision, because it is a matter of self-contained area. The vision of the 'damsel' too is circumscribed ( सिमित गरिएको ) by its transitoriness, as the pleasure-dome was by it's topography ( भौगोलिक वर्णन ). Both are an idealized as Brooke's fishy heaven. Question Answers Of "Kubla Khan"
0 Response to "Kubla Khan | Questions And Answers | Class 11"